The sides and back of your bus are prime advertising real estate on the road! Turn your bus or fleet of coaches into mobile billboards for your company with a professional bus wrap. 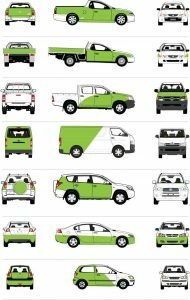 Auto Wraps Australia has been in the vehicle wrapping industry for more than 30 years so we know what works and what doesn’t when it comes to bus signage and bus graphics. Our clients include private bus companies and many private schools and colleges. 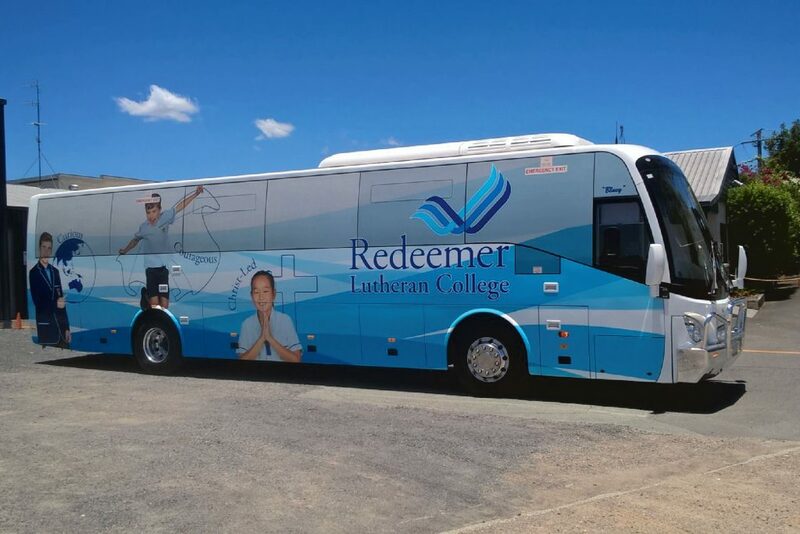 A full bus wrap adds an element of prestige to your image and when the time comes to sell or upgrade your wrapped bus, the vinyl can be removed, usually leaving unblemished paintwork underneath. Our in-house designers are guaranteed to have plenty of great ideas about how to make your logo and message stand out on the road. Anything and everything is possible when it comes to designing your bus signage because we have such a large space to deal with. We can use your existing designs or suggest new ideas. 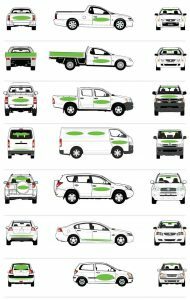 Spot Graphics: These are cut-out designs that are applied to specific areas of the bus, such as a door, side panels or back area. Half Wrap: Part of your bus will be covered by vinyl wrap featuring your bus signage and the rest will be your existing paintwork. 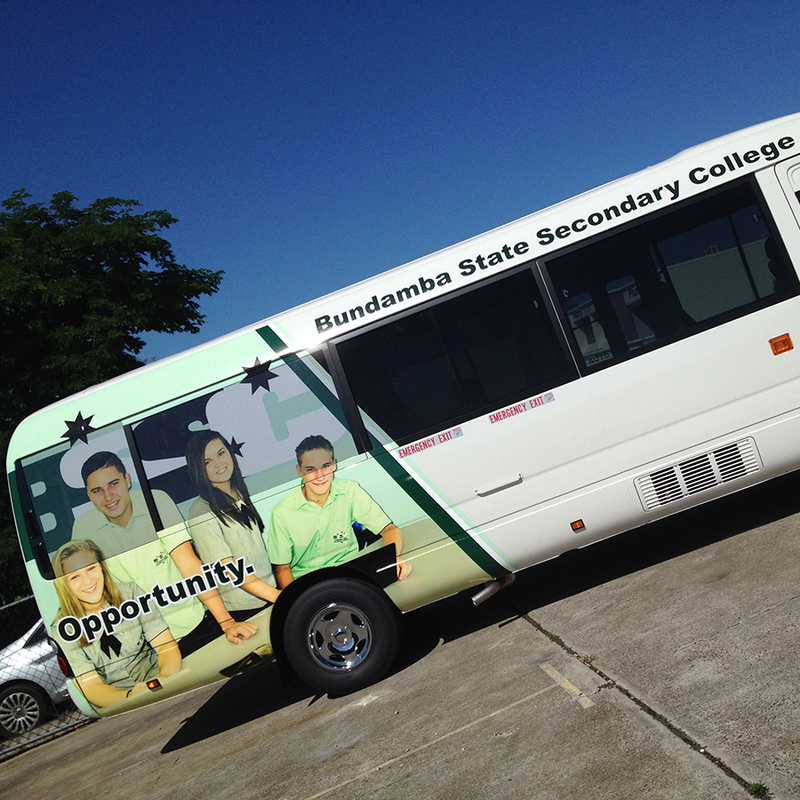 Full Wrap: The entire body of your bus is covered by a customised vinyl wrap featuring your bus signage. This not only protects your paintwork for re-sale, but maximises your marketing space. You can also combine both partial wraps with spot graphics and even use the bus’s base colour as part of the design to minimise costs and maximise coverage. We know what works and what doesn’t when it comes to converting your company logo and ideas into a practical design suitable for your bus wrap. Tell us what you are wanting to achieve and how you see your design looking and we will give you practical advice. Got an older style bus? Wrapping your bus or fleet of buses with full wrap vinyl signage will instantly modernise it. It will also provide protection for the paint work underneath, which will improve your bus’s re-sale value. Our process for designing and installing your bus signage is simple and hassle-free. If you have no prior knowledge about bus signage, no problem! We have been in the vehicle wrap industry for more than 30 years so we know all the ins and outs of both bus signage design and bus wrap application and can walk you through the process step-by-step. The first stage is taking time to understand your design or the look you want to achieve. Once we’ve received your design or created one for you, we can get started on converting it to a bus signage design that will work practically on your bus. We know from experience what tweaks need to be made to designs to take into account windows, side mirrors and curves. We are also happy to work alongside your existing marketing team to ensure you receive the best possible design that matches your requirements. Another important consideration is to ensure the correct one-way vision film is applied to the bus’s windows. 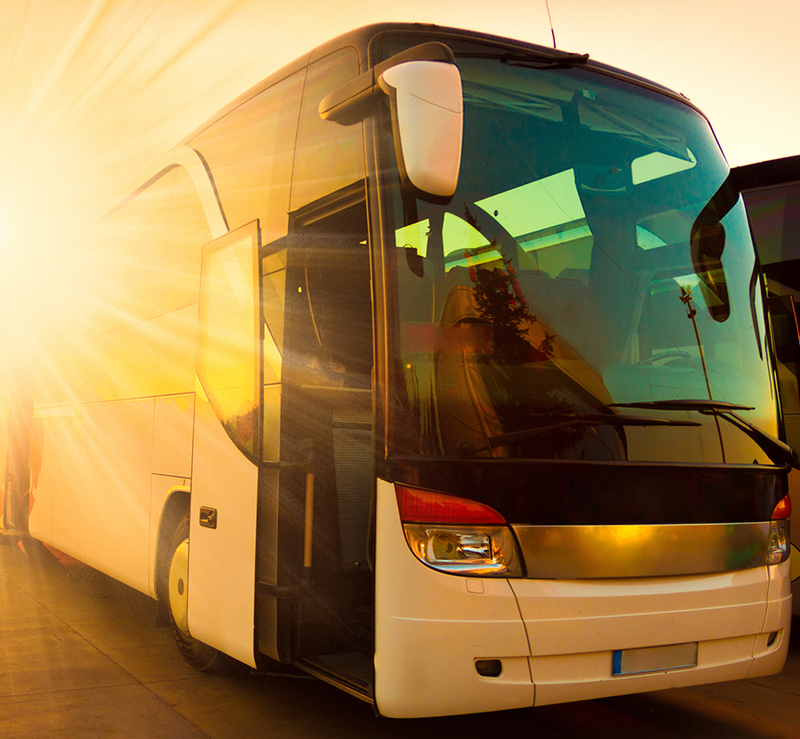 We know what type of one-way vision film is required for buses so your wrapping will meet legal requirements for vision, while also looking good from the road. 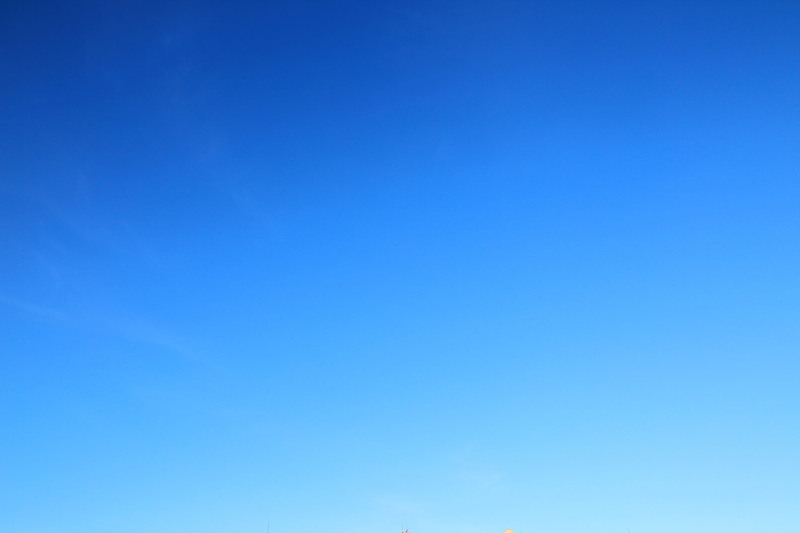 Once your design is finalised, we’ll then visit you on-site and measure your bus precisely. If any problems arise when we’re converting your design, we will let you know and offer solutions. 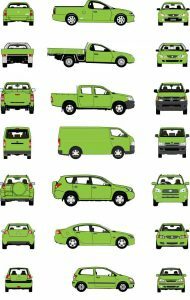 Our technical staff are qualified tradesmen who know the different specifications of every vehicle wrap manufacturer. Each bus we wrap undergoes a three-stage cleaning process and all wraps are applied in a sealed workshop environment. We only use genuine, warranted inks to prevent fading. If you have a fleet of buses and need help co-ordinating the logistics of your wrapping to minimise the time your vehicles are off the road, we can help with that too. If you have an older style bus you will be amazed at what a difference wrapping will make to the look of your bus. A full wrap disguises imperfections in the paintwork and leaves you with a bus that looks modern, professional and ready to get to work.